We have listed all of the Gastonia food pantries that we have found. With help from users like you we have compiled a list of some. If you know of a food pantry that is not included here, please submit new food pantries to our database by going to the ADD A LISTING link on the header of our website. Hours: Tuesday and Thursday 9:00am - 12:00pm New clients bring proof of financial income and expenses for everyone in household with picture ID. Clients wait in line outside starting at 9:00am. We serve 150-400/day. Clients can receive a monthly food box and weekly snacks and drinks. We serve homeless, elderly, low-income families, unemployed. As One Ministries of Gastonia is a partner agency of Second Harvest Food Bank of Metrolina (SHFBM). 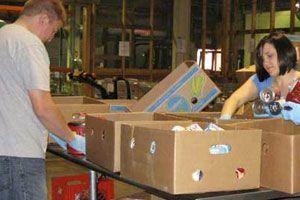 SHFBM partners and distributes food and essential grocery items to approximately 550 hunger feeding agencies in 19 counties in North and South Carolina. For more information, please call. Due to the low number of listings in Gastonia, we have added area listings below.